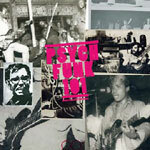 Psych-Funk 101 introduces the global phenomenon of psychedelic funk music, covering the golden years (1967-1980). This compilation focuses not on American and British bands but on the bands throughout the Global Village that were influenced by the likes of James Brown, The Meters, Sly and The Family Stone, Booker T and The MGs and The Bar Kays and unsung rhythmic forces such as drummers Bernard Purdie, Idris Muhammad, Earl Palmer, bassists such Carol Kaye and Jimmy Lewis. This compilation features bands who took that energy and combined it with the flair of psychedelic-rock musicians such as Jimi Hendrix and the ensemble known as Cream - as well as pop-rock acts taken by the experimental side of psychedelia such as The Beatles. But the global psych-funk bands added their own, unique cultural flourishes and the result is mind-bending. The CD is in a digipak with a 36 page booklet including detailed liner notes with rare photos, ephemera and full annotation and band histories.